Once we got to church, Denton wouldn’t come into the church. Denton stood out by a tree, in the rain, for a very long time. Cadrian wouldn’t go into his classroom. Cadrian stood in the hallway for a very long time. Denton sat down on the stairs and held onto the banisters. Denton ate my sweet roll. Denton had to sit with me in church. Denton still wouldn’t go down to his classroom. The preaching started and then Denton wanted to go down to his classroom. I had to get up in the middle to take him downstairs. Then Denton wouldn’t go into his classroom. Then Denton hid under a table. After church, I let the kids have a sweet roll each (even Denton) because I wanted to stop at a store to buy Cadrian some “fancy pants” to wear to church so he wouldn’t have to fret about wearing jeans to church again. I thought the trip would go better if they weren’t hungry. I asked the kids to sit a table while I went to the restroom. They didn’t. Cadrian and Denton wanted to talk with our pastor, interrupting him from a conversation. On the way to the van, Denton climbed up the scrolled metal porch pole outside the church doors and wouldn’t come down until he was good and ready. Denton and Cadrian climbed up on the cement parts of the parking lot light poles, significantly delaying our leave taking process. Then they ran all the way down the hill towards the creek. And didn’t come back for a long time. Then Denton wouldn’t hold still so I could buckle him in. Through all of this (and parts I left out), I’m feeling embarrassed. I’m feeling like my children are uncivilized little hooligans and we are never going to be able to be out in public. I’m feeling like I’m doing a horrible job of parenting. But through all of this, I am feeling pretty calm. I’m speaking pretty calmly. I’m not yanking on anyone’s arm. I’m gentle. The store I wanted to buy the pants at didn’t open until noon, and we weren’t going to sit in the parking lot for an hour. Wal-mart was right down the street. I debated about whether or not we should go, but decided that I really wanted to get Cadrian some long enough black pants. Part of it was guilt, I’m sure, for not having the right size pants at home, and making him wear a “not fancy enough” outfit. When we got to Wal-mart, Denton kept trying to bop out into the parking lot while I was putting Elivette in the wrap. I finally set him on the seat in front of me, but it was STILL like a mini-battle of him pushing me and trying to circumvent me so he could go get himself run over. I put him in a grocery cart and he stood up. I told him gently to sit down. I put my hands on his shoulders. “Sit down”. I had put up with so much $**# from these little so-n-sos in the past couple of days and now they are telling me they hate me?!! I tossed them back into the van. We are not even going to Wal-mart. If you don’t ever get your pants, you can blame Denton. I am DONE with “I hate you”. No one is EVER saying that again. You think it’s ok to hide behind a tree and not come into church? You think it’s ok to scream in Best Buy because you don’t want to be in a stroller?! You think it’s ok to scream in the parking lot of Best Buy because you don’t want to get out of the stroller?! You think it’s to scream all the way to church because you don’t get to wear what you want?! I don’t want people yelling at me all the time, but do I get what I want?! I don’t want people to tell me they hate me, but do I get what I want?! I laid it on thick. I laid it on loudly. I laid it on with gritted teeth. I ranted. I raved. ALL. THE. WAY home. I cringe reading that, knowing how I sounded. I can’t imagine what was going through their little brains hearing that. The message was fine. The delivery needed a lot work. I need to find a satisfactory way to tell them what I am experiencing in a way they can understand me, before I reach this point. I tell them “When you do X, I feel Y” already, but sometimes it doesn’t seem to do anything to change behaviors. I need to find a way to do better self care. Journaling helps. Blogging helps. I need something to change. Somehow. I’m already doing all I know to do, and feel capable of doing. You probably know I have five children. 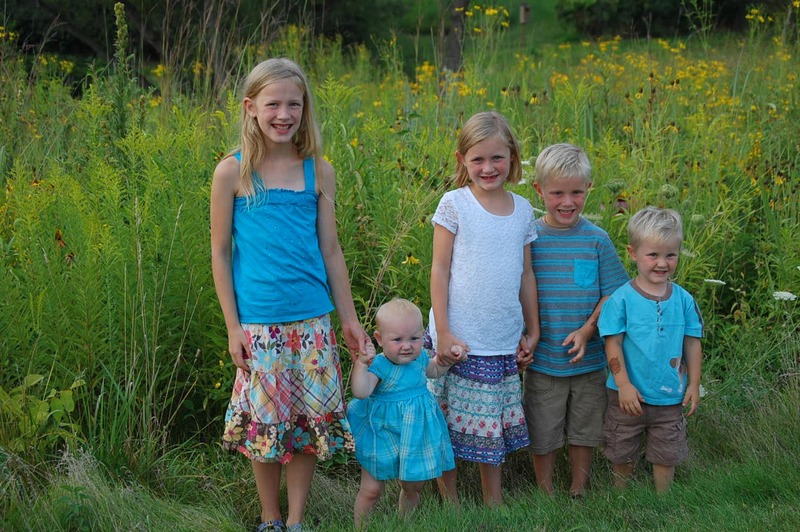 Five adorable, rambunctious, full of life, spirited children. My children overflow with exuberance and willfulness. You probably also know that in the past year we have completely revamped our parenting stratagem. Gone from corporal authoritarian parenting to gentle unconditional parenting. I’ve posted a little about that here and here. You likely do not know I grew up in a home, while filled with love, that was also filled with anger, pain, rage, yelling, shame, and abuse. My parents and I have a wonderful, growing relationship now. They did the best they could based on their own upbringings and the tools they had at the time. This combination has left me ill prepared for the kind of parent I want to be. The kind of mother I feel God is calling me to be. The kind of peaceful home we desire. It is so hard to change the very way I think, the way I react, to what I know to know to be true, but is not at all natural to me. Enter Parent Coaching. I was searching the internet one night looking for some gentle parenting ideas to help me with one of my children in particular. I have found the more I read to reinforce my beliefs, the better I do and the more it becomes part of my core. I had not even heard the term parent coaching before and I was intrigued. I perused Kassandra’s site for a while reading her blog and getting some idea of who she was and if her philosophies aligned with mine. When I was satisfied they did, I filled out the form on her site. She emailed me the next day and we set up a time to talk on the phone when Kevin and I both would be available. After talking with her for a while, getting to know one another and what my expectations and hopes would be, we decided to move forward and agreed to six sessions. That was in late October, and I am still meeting with her via Skype, weekly. This work has been life changing for me personally and the landscape of my family. Kassandra introduced me to the world of inner empathy. At first, it felt a little awkward and weird–listening to myself essentially have conversations with parts of myself. I would normally identify those parts as emotions, feelings or physical sensations but for the purposes of this inner empathy work, we call them parts. When you listen to and hold the parts of yourself in your own compassion, without trying to change or fix them, miraculous things happen. This work has been SO life changing for me that I went through a training Kassandra held to become a parent coach myself. This work has been so life changing, I can’t help but want to offer it to the rest of the world! I am so blessed to have a like minded group of friends. One of my friends is part of our local Birth Coalition, and we’re having a birth conference this weekend. She asked me to be part of her talk on baby wearing. One of the things I want to emphasize about baby wearing is that it doesn’t have to be expensive. Sure , there are companies who have jumped on the bandwagon as baby wearing grows in popularity and their carriers are upwards of a hundred dollars. People who brag about their “wrap stash” and spend more on a wrap than I do on a year’s wardrobe are elitist in my humble, blunt opinion. My main go-to wrap is 9 years old. It is a 10 foot piece of 100% cotton I bought for $1/yard when Aviana was baby. It was the first time we had used my vintage auction score of a sewing machine. Kevin helped me hem it. Kevin! He had sewed in 7th grade home-ec. I think that was the first time I’d ever sewed. A three and half dollar wrap. Seriously. Baby wearing is NOT complicated. Not expensive. It’s common throughout the developing world. 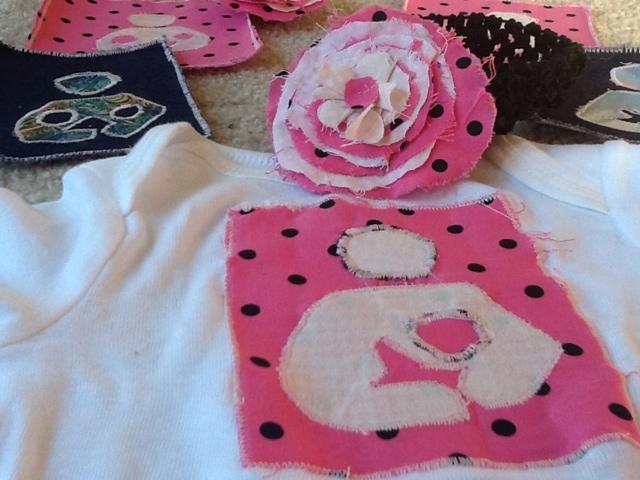 You do NOT have to spend a lot of money to benefit your baby in SO many ways by wearing him or her. It’s great for you too! Baby Wearing on Local TV-see it here! If you can get hold of this book, I highly recommend it. My copy is published in 1972, but it seems like it’s much older. It’s sweetly written and endearingly illustrated. I do like everything I’ve read by this author. 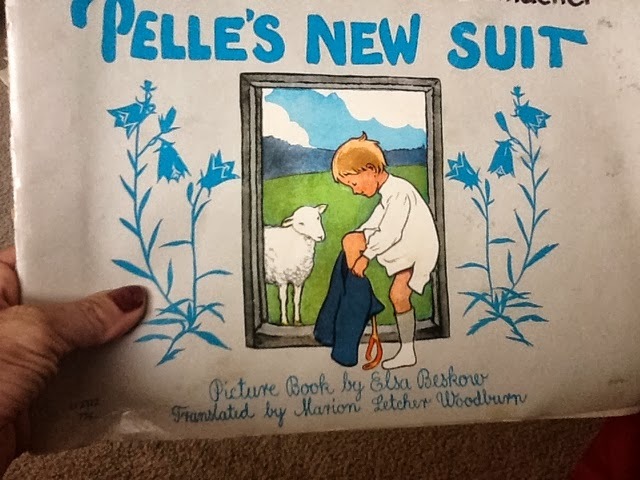 A succinct summary: Pelle wants a new suit, so he shears his lamb. He trades chores with various people until he gets all he needs to have his suit made. Then he works for the tailor who makes him his new suit. . The jobs Pelle does and the jobs he asks others do are all but lost arts; carding wool, spinning, weaving cloth, even making a suit! We have lost something in our drive-through, cheaply-made, satisfied-with-good-enough culture. How do we get it back? Do you feel that a modicum of self reliance is important? We’ve lost the sense of independence that even a young boy can feel capable, can know that he has what it takes to get the job done. A lot of people are upset these days, in light of the government’s current antics. No one is taking care of them. Babies are going hungry. People aren’t working. People aren’t getting paid. l wonder if Pelle and his family would ever have expected their government to take care of them. You may remember that I’m revamping my parenting around here. We stopped using physical discipline in our repertoire this spring. I’m also working on no yelling. This is SO HARD. I want to blame my upbringing, the only modeling I had, my naturally loud voice, the general chaos around me, the fallacy some kids just need yelled at because they tune everything else out, anything I could blame for my yelling. But really, the fault behind my yelling problem lies with me. Last month I felt embarrassed by the (albeit definitely not acceptable) actions of one of my children in a public setting and I berated that child all. the. way. home. from. town. It was terrible. I would tell myself to shut up and I would, and then I would start spewing verbal bile right out again. That day I promised that I would never do that again. I set small goals for myself. Just get through the day. Just get through another day. I read encouraging blogs. (The Orange Rhino and Dulce de Leche are two of them). I prayed. I journaled. I explored my childhood hurts more. I had a plan. I was accountable to people. Suddenly it was a week, and I hadn’t yelled. I may have talked sharply. I may have raised my voice a bit. I may have gotten frustrated and irritated and lots of other “ateds” but I didn’t yell. I am giving myself grace. A lot of grace. This is a new skill. My family is detoxing from the authoritarian parenting we’ve been doing for 9 year. Then another week. I was feeling like this was actually possible–raising children without yelling. Truly being a gentle parent. Soon it was three weeks. Could I make it a whole month? I should have taken him to Kevin and made sure he was going to stay there, peacefully, calmly. All I could think about was getting the glass picked up first, and then I was afraid he would get glass stuck in his knees and legs and I couldn’t think of anything to do. I just reacted. I thought maybe I can excuse that slip up under the heading “dire circumstances”, and still count this as a no yelling day. But then, (much later, after several small people yelled at me, tantrums, dinner, crying small fry, losing parts of our brand.new.game., arguing with me and each other, bicker, bicker, boss, boss, bicker) Cadrian kept getting out of bed, acting like he’d never been put there to begin with. I was cool. I sent him back to bed. Several times. I was chill. He commenced a fit. A yelling. Screaming. LOUD. Fit. I was done. I went in to talk to him, and discovered he had gotten out a dozen wooden puzzles, when we had just cleaned up his room, and knocked down the shelf which had more puzzles on it, in the process. And just like that, I blew my record. I went back to count and ironically, today would have been 31 days of no (real) yelling. So we begin again tomorrow. As always, His mercies are new every morning. He has grace for me. I have grace for my children. We can do this. I can be a peaceful parent. I can completely retrain my brain. I can change the modeling I give my children. I will have self control. I can overcome my upbringing. I have a new heart within me. They are precious gifts. They deserve to be brought up with peace filled gentleness. I’m participating in Mothering’s Blog about Breastfeeding Event. Several years ago when I first started nursing babies, I didn’t even know there was such a thing as World Breastfeeding Week, or The Great Latch On. I didn’t know there was an International Breastfeeding Symbol (pictured in the photo below). I knew a few other people who nursed, on a schedule, pumping while they were at work, stopping at exactly six months. I watched my sister struggle tiredly to get her very sleepy 4 pound preemie to nurse. When I was pregnant, I asked her if I could see what it looked like when the baby latched on. My mom had nursed the three of us. This was about the extent of my knowledge. I wasn’t prepared for breastfeeding. I wasn’t prepared to have to pump every two hours to get my milk to come in after a traumatic emergency Cesarean. I wasn’t prepared to nurse a 5 pound preemie, in the NICU, standing my ground on the “no formula” rule I held against well meaning doctors and nurses. I wasn’t prepared to be crying in the middle of the night because she needed to nurse again, and it HURT. I wasn’t prepared to battle five months of thrush. I wasn’t prepared to have her need me so desperately. I wasn’t prepared to be my baby’s everything, her favorite thing, her only thing. I wasn’t prepared for her to drink her fill of the most perfect liquid in the world, formulated precisely for her growing body, and fall asleep contentedly at the breast. I wasn’t prepared for the ‘baby milk drunk’ as she would pass out, unlatch and milk would dribble out of her mouth as she would sigh happily. I wasn’t prepared for her to gaze up at me as she suckled, silently thanking me for the comfort, for the sustenance only I could provide. I wasn’t prepared for us to fall asleep together, her nestled safely in my side, smelling all those yummy-to-only-babies-armpit-pheromones. I wasn’t prepared for the depth and breadth of our breastfeeding relationship, the bonding it provided, the strength it gave to both of us. As she grew older, I wasn’t prepared for the simplicity of it. How easy it was. How wonderful. I’ve since nursed four more babes, the latest one about to celebrate her first year of life. Each child has definitely presented challenges nursing, especially in the beginning, but every time it has been so very worth it. This is one of my favorite breastfeeding photos. Cadrian is a few months old in this picture and I’m wearing my “I make milk, What’s your superpower?” tee shirt. I have been absent for quite a while. This may have been the longest I’ve gone without posting since I started this blog 7 years ago. God has been leading me in new directions, to new challenges. I have been putting off sharing because I’m not “there”. Not good enough at it. Not completely ready to be that real. That raw. There are a lot of layers to this journey, but the main crux is that God has asked me to change my entire way of thinking about this parenting thing and the relationships I’m building with my babies. More than anything, I want to lead my children like Jesus. I want to point them to Him in all we do. I fail miserably more often than not-it seems-but I try. Too, I research my parenting decisions to the point of annoyance: cloth v disposables, home v school, home v hospital, repeat Cesarean v VBAC, unprocessed foods v Standard American Diet, et cetera ad nauseam. For many years, up until a few months ago, this meant disciplining according to the “Biblical” methods of punishment, including spanking and swatting. And, because of my upbringing and spirited nature, yelling. Most of the time, the swats were ‘by the book’, not angry, not out of control, doing my best to dole out “Biblical discipline”, and show God to my children. Now I’m changing all that. I took a second and third (and many many more) look at what the Bible really says. I prayed a lot. I googled a lot. I turned to commentaries and back to the Bible. Until now, I had a very, without realizing it, adversarial style of parenting; an us v. them attitude. I thought you had to ‘win at all costs’, you had to make them ‘submit. I honestly thought this was right. I thought this was Godly. I believed in this. I trusted men and women of the faith who are after our children’s hearts for the Lord, who I believe are well meaning but very wrong. Until now, I thought “gentle parenting” was UNparenting. I thought taking punitive measures to force obedience was the right thing to do. I thought I could ‘break a child’s will without breaking their spirit’. I thought this was best for them, for our family. It is hard to admit when you are wrong. I am learning new tools. I am learning new ways in which to interact with our beautiful gifts from above. I am failing. A lot. I am thankful His mercies are new every morning. I am thankful for this new challenge. Now I know better and I’ll do better. These precious gifts are too valuable not to. We tell our children that Santa Claus is a Christmas tradition. We tell them people like to pretend he’s magical and that he’s a fun game people play. Just like candy canes and holly, Christmas carols and Christmas cookies, Santa Claus to us, is just another symbol of Christmas. We do not think it’s a good idea to try to get them to “believe”. We feel that would be lying to our children. Calling Santa to tell him your child’s being naughty? That seems like lying and kind of mean manipulation. Just discipline your child for disobeying and move on. The “Elf on the Shelf” seems like more of the same–lying to your babies. We want our children to trust us, to believe us in all things and getting them to think a make-believe person is real would drastically deter from that end. And of course, we want our chiddlers to remember that Christmas is a celebration of the coming of the Christ child. Even though it was originally a Pagan holiday, even though Jesus wasn’t really born in December, we now use this day to honor His coming. The light of God in human form. An undertaking, a promise, a gift I’ll never really be able to comprehend. A grace I don’t deserve. A forgiveness I could never be grateful enough for. To honor God sending His Son to sacrifice for our sin? So I could be face to face with the Perfect Holy One who is our Heavenly Father? I don’t know why He allowed us to be worthy, but am so thankful He did. That’s what we celebrate. But celebrate Santa? Not so much.